THE SKY'S NOT THE LIMIT! 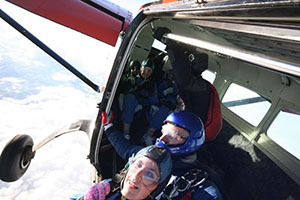 On Saturday 13th October, Team Restore, Wendy, Tracey and Daniel took to the skies to raise funds for Restore’s nominated charity, The Surrey Care Trust. 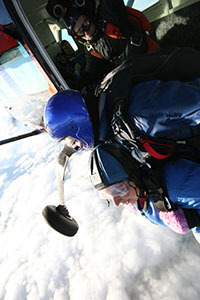 Delayed by hail and rain showers the intrepid trio eventually flew up above the clouds through the hailstones! They bravely agreed to increase their skydive from the planned height of 10,000 to 15,000 feet. On landing safely all three agreed it had been an exhilarating and amazing experience. Wendy and Daniel would definitely do it all over again and Tracey was pleased to have taken part. They all feel however that they may have been upstaged the following day when Felix Baumgartner skydived from 24 miles above the earth! On the other hand, he wasn’t being sponsored for the Surrey Care Trust! Restore Group provide a range of services from pure storage to a comprehensive, compliance-based records management programme that puts you back in control.